It’s the time of year when that local sketch comedy institution, The Second City, reveals its Spring Mainstage revue. This edition, titled The Hotline Always Blings Twice, is a love letter to The 6ix replete with sketches referencing TTC streetcars, the Toronto Blue Jays, Murdoch Mysteries and even Drizzy himself. Unfortunately, I don’t think this spring chicken was quite ready to hatch. The show opens with a political stump speech by Etan Muskat, full of jingoistic Canadian patriotism and finally veering into a vague spoof of Donald Trump’s “I will build a great, great wall on our southern border” speech. I found the bit never zeroes in on any particular satirical target and never really hits on any resonant points. In a post Daily Show/Colbert Report world, that kind of tepid, half-hearted satire just falls flat. Likewise, a musical tribute to Justin Trudeau later in the show features Kyle Dooley in a silly-looking glam wig as our hunky new Prime Minister, but the entire sketch has an odd tone and doesn’t play off any fact other than Trudeau gets a lot of attention for his looks. In both sketches, there’s nothing biting, clever or insightful enough to make the satire work. Written and performed by Mainstage cast members Leigh Cameron, Kyle Dooley, Becky Johnson, Etan Muskat, Kirsten Rasmussen and Kevin Whalen, and directed by alumnus Chris Earle, I felt Hotline just played it way too safe. Even the office party and bus tour crowds who frequent The Second City are familiar with the level of edginess of late night TV talk show hosts but the show rarely even approaches that level. The most successful sketches came when the cast finally risked venturing into some slightly darker territory. 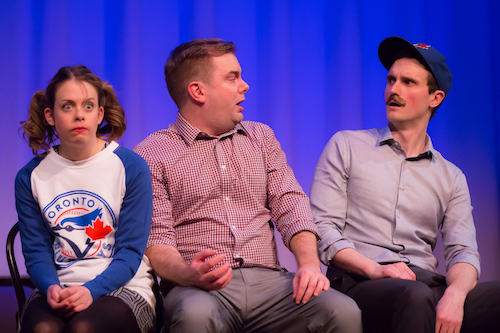 A sketch where Whalen and Rasmussen play a father taking his daughter to a Jays game only to be heckled by a hardened fan (Dooley) for being “bandwagon jumpers” took a wickedly funny and unexpected dark turn that resulted in one of the funniest moments (and callbacks) of the evening. Likewise, when Whalen emerged on stage for a solo bit sporting a nondescript middle-eastern accent and claiming to be a Syrian refugee at a grade school class’ show-and-tell I swallowed hard, unsure which direction the sketch was going to take but the result was a dark, cutting commentary that made me guffaw. It was the only sketch that felt remotely edgy. Other attempts at topical humour met with mixed results. The sketch where Muskat and Rasmussen took the etiquette around binge-watching Netflix to an over-the-top level resulted in a lot of familiar laughs. I also thought the one where Cameron, Whalen and Dooley took a film noir approach to the Uber vs. Taxi debate was clever. However, I thought the sketch about unfriending annoying people on Facebook was a bit too obvious and seemed a couple years too late to be truly topical. Also, the usual 11th hour semi-improvisational sketch which features an unwitting audience “volunteer” is absent from this revue which I found regrettable since it always brings up the energy in the home stretch of the show. All in all, I think The Hotline Always Blings Twice still needs more work, some re-writes and more time to work the material in front of audiences before the show pops. Shows run Tuesday to Thursday at 8:00 p.m., Friday and Saturday at 7:30 p.m. and 10:00 p.m., and Sunday at 7:30 p.m.
Tickets $25.00 to $52.00, Dinner and Show packages available. Student Tickets $14-$18 (not available for Friday and Saturday 7:30pm performances). I added her name to the photo credits. Thanks. why does the outstanding live music never get mentioned in the second city show reviews kudos to the music director!!!! !